I don't know about you, but when a separate Oscar category for Best Animated Feature was inaugurated, I welcomed it as a chance to open audiences up to the rich world of cartoons, CGI and stop-motion that exists outside of the usual Disney/DreamWorks axis of evil. (Plus, I like to think that advancements in animation will mean fewer live-action cinema - meaning fewer borderline-psycho actors employed in our midst - and that can't be a bad thing). So, perhaps thanks to the Academy, more viewers are turned on to stuff like SONG OF THE SEA and the output of Studio Ghibli than would have been otherwise. Still, there are some major animated features that take some time to get here. I'm still curious about FELIDAE, the German cartoon based on a best-selling thriller novel (that never broke big with American readers) about a cat version of Sherlock Holmes. Then there's NOCTURNA, a Franco-Spanish epic that was completed all of eight years ago. Now it's finally shown up here on disc. 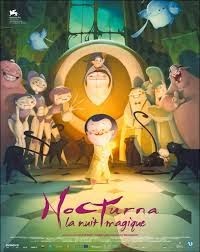 No relation to an obscure vampire comedy of the time title, NOCTURNA is flawed but visually sumptuous. It would seem to owe much to Windsor McCay's groundbreaking surreal newspaper comic-strip "Little Nemo in Slumberland" (itself the basis for a rather tepid 1989 cartoon feature). An orphan boy named Tim, afraid of the dark, is unable to sleep one night and crawls out onto the roof for the comfort of looking up at his favorite star - which he suddenly cannot find. In the process, Tim stumbles across the realm of Nocturna, a hidden society of night-dwelling creatures who orchestrate the routines of the non-daylight hours - everything from scripting dreams to tousling the hair of unwary sleepers. Tim is shown around Nocturna by a big, burly "cat shepherd," whose job is to herd the night's many prowling cats (that may be a rich joke. It's rather hard to tell). Meanwhile, stars keep disappearing, and Tim tries to find out who or what is responsible. The culprit is the film's weakest point, a spreading phantom of inky humanoid blackness called the Shadow, artfully rendered but mystifying in terms of origin, motivation, operation and just about everything. Maybe he's the "Nothing" from THE NEVERENDING STORY, with more/less personality. Tim's fight against the seemingly undefeatable Shadow [SPOILER ALERT] seems to have something to do with the boy losing his fear of the dark, but beyond that I was pretty lost in the murk myself as things plod to a happy ending. Best just sit back and enjoy the designs in NOCTURNA, with unusual character concepts and earth-tone colors that tend to make Tim and everyone else look a bit like root vegetables - except the duplicitous little CEO-type guy in charge of managing Nocturna. He somewhat resembles vintage cartoon caricatures of Jews in old-time anti-Semitic propaganda. Boy, can you imagine the uproar and the camera-hogging "activists" venting their outrage (and demanding their names get in print) if that character came out under Disney's umbrella? Maybe it's a good thing this feature is so off the radar. Even the English-dub vocal cast (seemingly made up of UK performers) is refreshingly free of distracting celebrity cameos making pop-culture wisecracks.